Compressing strut springs is an essential part of car maintenance, but it can be one of the biggest hassles. Strut springs are standardized, yet there are dozens of different types. Finding the right string compressor which is easy to use might be nearly impossible. Universal strut spring compressors exist, but they vary drastically in quality. In this article, we’ll show you a handful of the best strut spring compressors and describe the features that you’ll need to look for to make a good purchasing decision. What Should I Look For In A Strut Spring Compressor? How Long Should I Expect My Strut Spring Compressor To Last? Does The Material Of The Strut Spring Compressor Matter? What Kinds Of Strut Spring Compressors Should I Avoid? What Is The Best Way To Power The Strut Spring Compressor — Hex Key, Or Power Tool? The OEMTOOLS 25550 MacPherson Strut Spring Compressor is a sturdy strut spring compressor which is perfect for easy compression. Any MacPherson strut spring will meet its match with this compressor. The compressor features broad spring contacts, which help you to get the lock you need. Likewise, the detent pins work to maintain the lock once you have finagled the compressor into position. With the help of this compressor, you’ll never struggle to replace strut cartridges or fix the strut assembly. All of the individual elements of the compressor are hardened and made of tempered metal. Thanks to a 10-inch size when fully extended, this compressor is ready for anything. You do need to take one precaution while using this strut spring compressor, however. The threads of the compressor should be lubricated carefully to avoid seizing of the center screw, which can mess up compression efforts harshly. The 8MILELAKE Macpherson Strut Spring Compressor (Red) is ready to be a durable tool for all your strut spring compression needs. Most MacPherson strut springs will be served by this pair of compressors. The compressors also come inside of a handy red carrying case, which is a nice touch. The center screw of these strut springs is extremely fortified, so you won’t need to worry about wear and tear. They do tend to seize up after extended use, however, so you should invest in a good grease or lubricating gel. The locking pin on the strut spring compressor ensures that compression persists safely so that you can perform other repairs in peace. You shouldn’t use an impact driver when using this strut spring compressor, nor should you place 100% of your faith in the locking pin, as always. The hooks should be aligned with the safety pins backed out such that the hooks can make it over the springs when you are trying to seat the compressor. This additional step may seem like an added inconvenience, but it’s there for your safety. 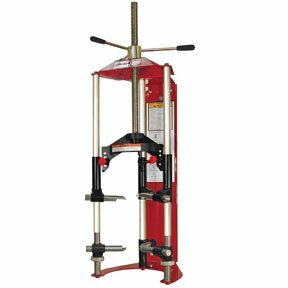 The Branick 7600 Strut Spring Compressor is an extremely heavy-duty unit which can compress practically any size strut spring in total safety and ease. This strut spring compressor is a beast. As is evident by its standalone construction, this compressor is intended for the strut springs of semi trucks. No adaptors are required to adjust the compressor springs, so you won’t need to worry about compatibility. The compressor itself is made out of steel, and every part of it is designed with your safety in mind. Unlike with other strut spring compressors, this unit keeps your body far from the direction of the compressed spring’s force. You should still be careful, but the mounting options for the spring add yet another dimension of safety. The other main feature of this compressor is the wheel-turning compression handles at the top. You’ll need to exert yourself for the more serious springs, but the advantage is that everything is immobilized, unlike with other compressors. You may not need to lubricate the central screw of this compressor provided that you do not over-compress springs. You may benefit from sharpening the ridges in the area of the greatest stress, but it’s far from necessary. 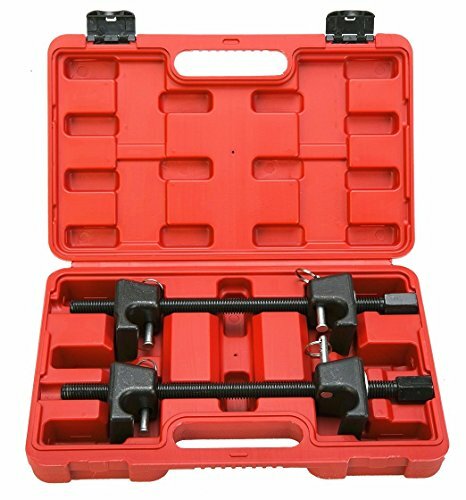 The ABN 11.5” Inch Strut Spring Compressor Tool – Set of 2 (Pair) – Macpherson Spring Compression, 13/16” Socket 1/2″ Drive is a standard strut spring compressor with a wide range of safety features and also compatibility options. These ABN strut spring compressors have a threaded rod which makes for easy locking into position. The detent pins help to stabilize the spring while also providing a measure of safety for you. At the core, the threaded central rod can be attached to power tools or hand cranks depending on your preference. Especially if you use a power tool for compression, you need to lubricate the entire central rod extensively due to the carbon veneer of the compressor. One end of these compressors have a hex-key port which you can use to lock in and rotate as needed. This is a nice touch which is surprisingly absent from most other strut spring compressors. The center screw and brackets of this compressor are unlikely to fail during your lifetime, though the center screw may erode if it isn’t properly lubricated. Given how long the screw is, erosion is not a very large concern about using the compressor. The pins are unlikely to ever break. 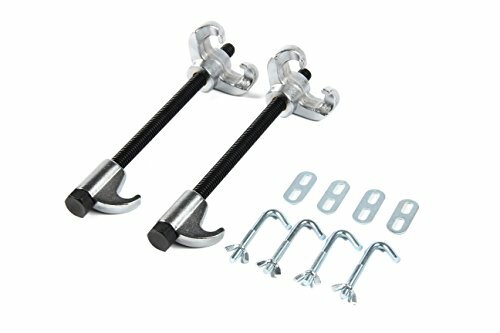 The Shankly Coil Spring Compressor Tool (2 Pieces – Universal), Spring Compression Tool is a composite material compressor which is optimized for light commercial vehicles rather than consumer vehicles. Most strut spring compressors are optimized for compatibility, but this strut spring compressor has a specific niche: commercial vehicles. 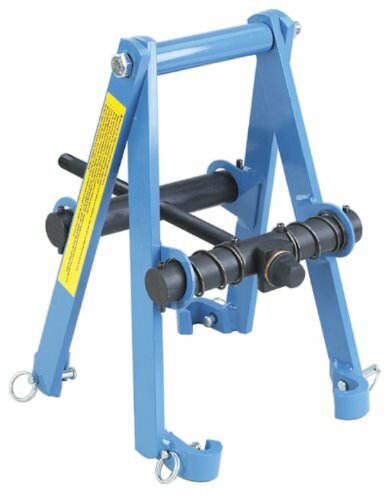 Thanks to its oddly shaped hook-and-clamp design, the strut spring compressor can lodge itself within the small areas underneath commercial vehicles. This tool can also be used to compress other coil springs, a nice feature that most other strut spring compressors lack. The 10-inch bolt on this strut spring compressor is standard, and offers 9.5 inches of safely usable space on the main screw. The main screw is forged from enamel, which makes it a bit less durable with regard to torsional force. On the other hand, the enamel forging makes for a strut spring compressor which is far more tolerant of tensile force, which is the primary force it will be facing when it is used in the shop. So, while improper use of this strut spring compressor will likely result in its premature malfunction, proper use of it is unlikely to ever need any maintenance or repair. Indeed, you won’t need to lubricate this strut spring compressor — a rarity among tools in its class. 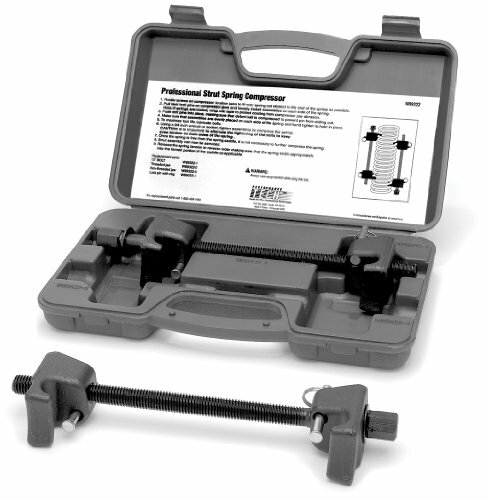 The Performance Tool W89322 Professional Strut Spring Compressor is a handy compressor which is great for amateur use. Most strut spring compressors come in pairs and are intended for professional use. This one, however, is a standard-design strut spring compressor which is priced and packaged to be useful for amateurs. On the unit’s carrying case, you’ll get a helpful guide to strut spring compressors. The guide will help you to compress your strut springs safely while also maintaining the life of the compressor itself. Thanks to the unit’s locking pin design, these compressors protect the user first and opt to be convenient second. The compressors are made from steel and capable of compressing the springs of any vehicle up to a light truck. For car repairs at home, it’s hard to find a better compressor. The only issue with these compressors is their lack of force multiplication. You’ll need to put in a lot of manual effort to compress the strut springs. The OTC 6494 Clamshell Strut Spring Compressor utilizes a unique design which only requires an impact wrench to operate. The triangular style of this strut spring compressor isn’t for everyone. Many users will find the added structure to be inconvenient. Others will find it difficult to isolate the strut springs as a result of the added bulk. But for those who need the added framework to ensure an effective lock, this is the best compressor that you could ever ask for. The compressor’s design plugs into the strut spring at its farthest tip, using the legs to steady the entire unit rather than using a clamp and locking pin to prevent slipping. The locking pins are thus in the legs of the unit. Professionals will likely be irritated by the number of additional actions required to prepare the four separate locking pins. These are valuable safety features for amateurs, however. Unfortunately, these safety features somewhat contradict themselves on the basis of the unit’s design. The user must be directly in the way of an errant spring to compress the spring, which means that a slip would put their hands directly in the line of fire. The main features you should look for in a strut spring compressor are safety and ease of use. Safety is the single biggest concern with strut spring compressors. The strut springs of a vehicle carry an immense amount of stored potential energy when they are fully compressed. If these strut springs suddenly get knocked off-center from the compressor, they will unfurl at extremely high speed while flying away from the vehicle, potentially hitting you. These compressed strut springs can cause serious injury when they are released. The single essential safety feature to look for is the locking pin. 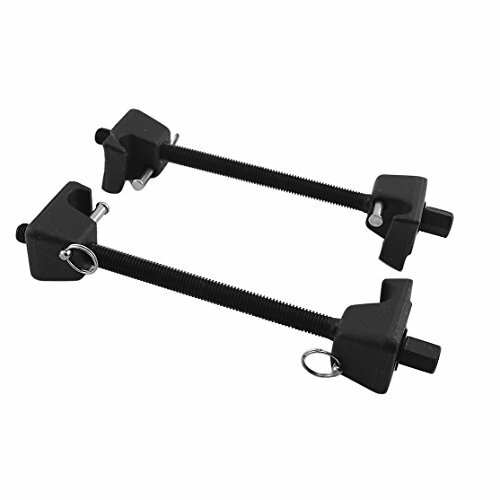 Every strut spring compressor has a least one locking pin which you will secure to preserve the compression. Multiple locking pins are safer than lone locking pins because lone locking pins can fail if they are brittle. The other main feature to look for is ease of use. Ease of use is typically at odds with safety. The more locking pins you need to secure, the slower each compression cycle will be. Most professionals will be fine with one locking pin and an acceptably long central screw. Your strut spring compressor will last longer if you take care while using it and perform basic maintenance afterward. Over-compressing strut springs is the single biggest stressor to compressors, and it’s also bad for the spring. After you use your strut spring compressor, you will need to re-lubricate it. There are several lubricants which are ideal, and most of them are lubricants intended specifically for the purpose. Without lubricating your central screw, you compressor may shear off chips of the screw while compressing. This isn’t dangerous, but it does eventually degrade the ability of the compressor to do its job. If you take good care of your strut spring compressor, it should last 20 years. Yes, the material of the strut spring compressor is a major factor. Most strut spring compressors are made out of tempered steel. This is a great material because it has high tensile strength and because it doesn’t disfigure easily. Steel also has a high torsion strength, and it isn’t brittle. Steel is the ideal strut spring compressor in most cases. There are some cases in which a composite or enamel strut spring compressor is preferable, however. Composites may have better characteristics than steel when it comes to handling incidental forces like torsion. Torsion shouldn’t occur when you’re using your compressor, but sometimes it does anyway if the lock of the compressor isn’t perfect. Composites are less likely to warp in the face of these pressures, though they are more brittle most of the time. Typically, composites end up being less durable than steel compressors though may be exceptions. The compressors to avoid vary with your intended use. If you plan on only doing occasional strut spring compression, you don’t need an industrial grade strut spring compressor which is a standalone unit with heavy cladding. 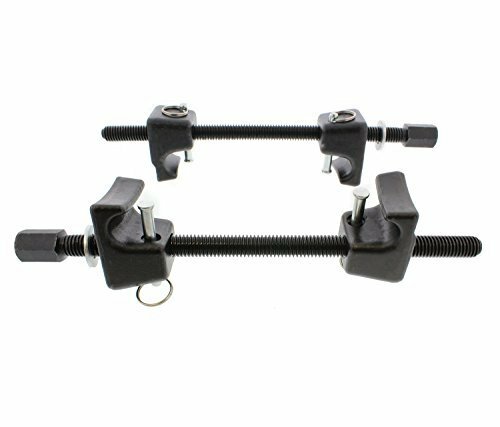 On the flip side, you also don’t need a strut spring compressor that has wide compatibility if you have no plans to use it on multiple types of strut springs. The best strut spring compressors for casual use are small units which work in common consumer vehicles. Professionals don’t necessarily need to avoid these small strut spring compressors, however. Often, they’re the right tool for the job. Larger compressor units can add a lot of bulk without adding much value if you’re already effective at the key competencies of compression. Most people will be better off using a hex key than a power tool to power the compressor. Power tools don’t have the same feeling of connection to the spring and the central screw of the compressor, which means that you’re far more likely to accidentally over compress the spring. Likewise, power tools are more difficult to use with some compressors than others, but a hex key will work for most, provided that you have the right size. If you plan on doing an abundance of strut spring compressions, a power tool is a great labor-saving feature, however. Especially once you have a good feeling for the way the strut springs behave you can easily compress them with a power tool far faster than with a hex key. Provided that you’re experienced, you can also avoid excessive compression once you can feel the difference via the power tool.